Today, the UFC officially announced that their monumental “UFC 100” event will be held at the Mandalay Bay Event Center in Las Vegas, Nevada. The July 11th event will be headlined by UFC welterweight champ Georges St-Pierre defending his title against Thiago Alves. It is also being rumored that if interim heavyweight champion Frank Mir is fully healed from his knee surgery, he will challenge champion Brock Lesnar as the night’s co-main event. The two were initially slated to scrap at UFC 98, however Mir announced last week that he injured his knee during training and would have to ride the pine for a while. Of late, the UFC has held most of their Las Vegas events at the MGM Grand Garden Arena, which can pack in 14,700 fans, as opposed to the 11,000 seats at the Mandalay Bay Event Center. Most recently, the MGM Grand played host to UFC 91 and UFC 92 to end 2008, and also hosted January’s UFC 94 event which featured the highly anticipated rematch between GSP and BJ Penn. 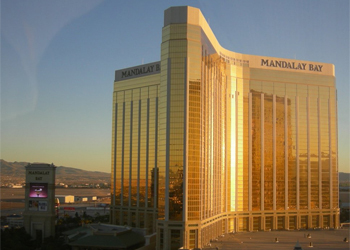 The UFC’s last event at Mandalay Bay was UFC 86 back in July.